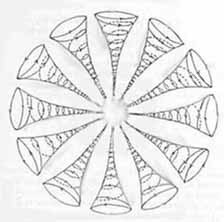 The word "Eye" has many meanings from an organ that detects light to the symbolic eye with its many metaphors that link to conscious awareness. Reality is a consciousness hologram virtually experienced through the eye of time. The physical eye has a pupil symbolizing we are pupils/students in a university or universe. We take for granted that we exist as 3D beings in a 3D universe, but physicists suggest that our world is just the projection of a reality written in 2D. Scientific American editor Michael Moyer explains. Eye of Horus and Isis 'I', Is-is, to exist. The detached capstone represents consciousness through the Eye. 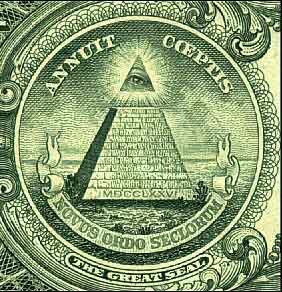 The eye in the triangle has been associated with the Eye of God and the Illuminati. We use the eye to see (sea) - water, the flow of the collective unconsciousness, grids (matrixes) of experience. To see an eye that is open means one is awakening to higher frequency or consciousness. Closed, means metaphorically one is still asleep. Gray aliens have black oval shaped eyes. Reptilians have vertical pupils. To understand that the eye is the window to the soul, there are 2 techniques you can use, alone or with others. Alone: Stand in front of a mirror in the dark. Shine a flashlight below your face pointing upward. Now stare at the eyes in the mirror and you shall see your image change into many people, some may not be human, all of whom are aspects of your soul experiencing in other grids. Two People: Sit across from the person in a dimly lit, or dark room. Place the flashlight below your face again. This will enable the other person to see you in other lives and tell you what they see as they look through the windows of your soul. They may also see themselves in that lifetime with you. Next repeat this by looking into the other person's eyes. It is important not to move while doing this form of scrying. To truly be skilled at this, you will take the other person, or yourself, to their 'soul spark' of light. It is the flicker of light, white, blue, purple, that you sometimes see in the periphery of your field of vision, for only a second. Always remember, your experience here is just that ... a second. 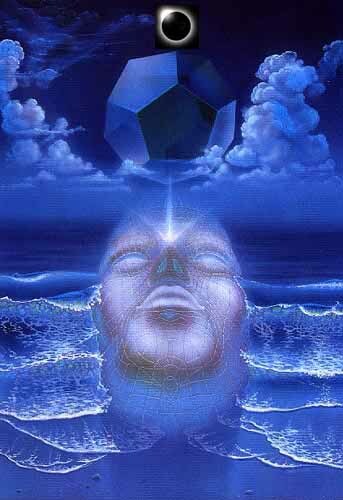 The Third Eye Chakra, or pineal gland looks into higher frequency (clairvoyance). in the Alchemy of Time.